When sitting on a bike saddle, the majority of the cyclists weight is focused on only a few centimeters of their behind. The position of a saddle is an important factor, and selecting the right model can significantly improve its comfort. Longer tours or activities carried out over several days can be greatly influenced by the quality of your saddle. Different models focus on different areas like padding, material and shape, all of which are specialized for their respective fields. 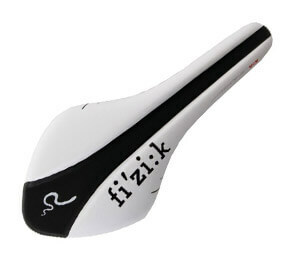 There is virtually no difference between the special saddles for road bikes and the ones for MTBs, even when it comes to manufacturers like Fizik. It's not surprising, since both ultimately share the same goals for maximum comfort on longer biking sessions. That means: If a saddle fits nicely on a road bike, then it will also fit on your mountain bike and vice versa. The distance between your sit bones is measured to determine the correct saddle size. If and to what extent a saddle is padded depends on rider experience and intended use. Performance oriented athletes prefer slim and hard saddles with little friction so their thighs don't chafe. It is often enough to simply raise or lower the nose of the saddle a few millimeters to prevent discomfort. Those who prioritize padding can choose between a diverse range of ergonomically designed, padded models. Aside from men's saddles, there is now a wide range of women's saddles that are cut and shaped specially for the requirements of the female anatomy. Some saddles provide space for attaching small saddle bags. While many models are placed on aluminum rails, there are also carbon versions. This material has different shock-absorbing properties which is why it is also used for saddle posts. Road bikes and cyclocross bikes sometimes feature suspension and shock-absorbing systems in the saddle post to increase comfort. If you want to select the right saddle size, you can sit on some cardboard and measure the distance between your sit bones. The right saddle will not create any one-sided pressure points and disperses the pressure evenly in the seat area. Pressure points should not occur, even during longer biking sessions. The right bike pants with high quality inserts and an ergonomic construction should also serve to increase comfort.